We set out later in the morning than usual. Steve suggested going to breakfast on the way, and my first thought was that it might be reckless to eat before going fishing. It was an unfounded superstition I didn’t realize existed — we usually headed out before the restaurants opened. There are some who keep impeccable fishing logs that improve success. They note such things as the date, start time, water and air temperatures, barometric pressure, structure and vegetation, water body and clarity, moon phase and details of fish caught. Over time, these notes provide trend data and foster private beliefs about what kind of day makes for good fishing. They helped me document and learn from personal observations. It was also a dangerous amount of information for an unqualified amateur to consider. My notes indicated that the best time to fish through the ice was after a storm, near structure and never when it was windy. But I found my journals left out the things I tended to blame most for success or failure — what shirt, socks and hat I wore. The logs left out the detail that I had never had a good day of fishing if I ate or drank anything other than black coffee before casting a line. I had been ordering banana bread for breakfast, and I couldn’t figure out which was unluckier: eating banana bread before ice fishing, or bringing a banana aboard a boat? I realized my thought process was more superstition than science. When you can’t admit your reasons, they may not be sound. We went to breakfast, and I reluctantly ordered toast. March is my favorite ice-fishing month. The days are longer, the temperature is higher and the ice is solid. Sitting in a camp chair on a white field of snow feels like a day at the beach. We planned to hike several miles to a lake that promised quiet hours of solace from work and social life. The words “sport” and “solace” were, centuries ago, used in combination. At the turn of the last century, conservation-minded sportsmen like Theodore Roosevelt used the term “sport” to differentiate hunters who hunted for personal use from those who hunted for commercial reasons. “Solace,” in contrast to “sport,” fell out of use as a term to reference the sporting life. More than catching fish for dinner, I often look forward to communion with nature — sport and solace. And, if that was the case, it didn’t matter if I wore my lucky hat, shirt or socks or if I avoided unlucky food items — bananas, breakfast, or both. Once I loaded my sled, it weighed 60 pounds. The snow was wet, and no one had been on the trail to the lake for weeks. We put on our snowshoes and began a hike that, in better conditions, took an hour. We got to the lake in an hour and a half. I fell to my knees at the shore, not because we reached our destination, but because I could see it would take another half mile of sled-pulling through overflow to get to our spot. At that moment, it was not the kind of trip most would consider a soothing and relaxing departure from daily life. Twenty minutes later, with the hole drilled through the ice and my lure in the water, I settled into my camp chair. People will talk about hearing the sound of a hungry wolf’s howl or the whishing of northern lights. These are the strange and wondrous sounds of wide-open spaces, of wildness and freedom. They are the top-of-the-world sounds of extreme solitude and attest to the bare beauty of open landscapes. I listened to the subtle sounds once the noise of our snowshoes sloshing through wet snow and the grinding and splash of the auger stopped. The creaking of the woods surrounding the lake and the occasional bird flight were as solacing as the smell of wet wood and metallic ice. When the arctic char hit my lure, I jumped out of my chair and fought what felt like a good-sized fish. When it emerged from the water — a flash of silver spots on pink skin — I called to Steve just as two camp robbers set in a nearby tree to watch and wait. We fished for a few hours before loading the sled and beginning the long trek back. By the time we reached the truck almost two hours later, my back was sore and I’d taken enough breaks to admire every kind of birch tree along the trail. Some were rose-and-gold-colored, some were beaver-chewed. Some were peeled and burned, loaded with snow or broken by it. Every tree and every fish was different and beautiful. 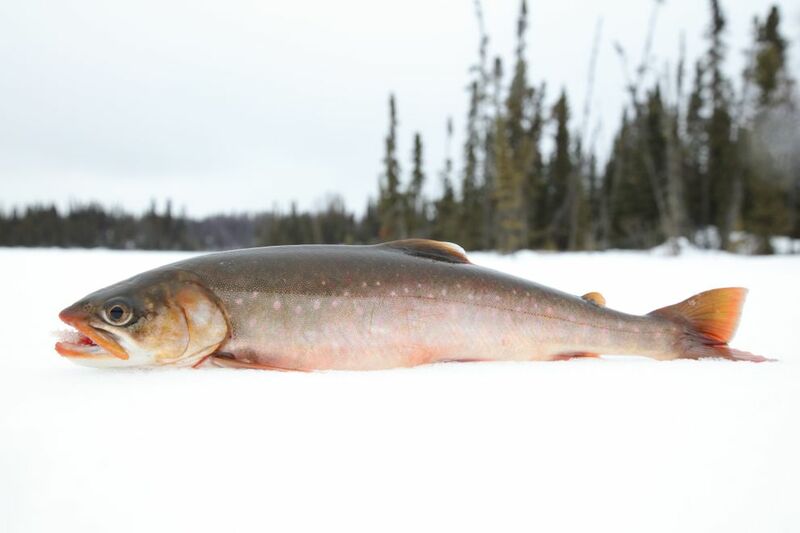 My motivation to go ice fishing was a desire to put hard work into an endeavor, to feel reverence and connection. Why did I worry at all about luck? Every outdoor experience is not a rush toward a lucky strike as much as a chance to put those silly thoughts aside. A belief in luck is comforting. It gives the illusion of control over the uncontrollable. Luck is more predictable than the weather. It’s intuitive, so it requires no skill or ability, and crediting outcomes to luck relieves you of all personal liability. It allows you to wear dirty socks without impunity. Most of all, luck doesn’t make or break the game of life. It’s a talisman to the indefinable element confusing all success stories: You don’t win because you’re lucky, you win because you played.